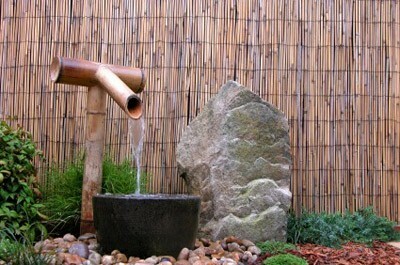 Using less expensive materials you can create a beautiful fountain for your garden. This is a guide about building an inexpensive water fountain. There is a universal appeal to the sound of trickling water - it calms the spirit and soothes the soul. Fountains are a great way to add a water element to your garden, and with today's self-contained models, you no longer have to worry about digging trenches and installing complicated plumbing components. Brings a sense of relaxation and tranquility to your space. Helps block out undesirable noise (like traffic or your neighbor's bad taste in music). Lowers the temperature of surrounding air and brings a sense of refreshment on a hot day. Attracts birds and other wildlife to your garden. Adds visual interest to your landscape and allows you to express your personal style. Fountains advertised as "self-contained" don't require any special plumbing. Once filled with water their pumps use electricity, batteries, or solar panels to keep the water constantly re-circulating. You will need to keep adding water to your fountain (sometimes daily) to prevent the water from evaporating and keep the pump from burning out. Self-contained fountains can range from the large and spectacular to the small and simple. Regardless of your style or space limitations, you should have no problem finding a fountain that suits your needs. 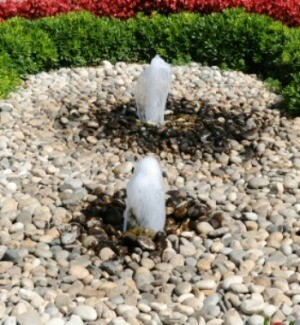 The most important consideration to keep in mind when choosing a fountain is the overall style of your home and garden. Whether you have a garden that is formal, contemporary or country in style, the fountain you choose should be compatible with your personal style- it should feel good. If you live in an apartment with a small balcony, a battery-operated table-top fountain can totally transform your space. Most of these fountains run on AA batteries, which is great if you only plan to run the pump a little bit each day. Because these models are portable and cord-free, they are easy to bring indoors (or transport to the office) once the weather turns cold. Self-contained wall mounted fountains don't require any special plumbing, but most require access to electricity to operate the pumps. Hang them, fill them with water, plug them in, and go! Garden real estate is valuable, which makes wall fountains a great way to introduce the ambiance of running water without sacrificing any of your growing space. Attach them to the side of your home, garage, or hang them on a privacy fence. Most are made of a lightweight materials designed to give you the look and feel of carved stone, but without the added weight. This means that even when filled with water, they will hang safely and securely on the wall. As an added bonus, wall fountains make it easy to keep children and small pets out of the water. Solar fountains couldn't be easier. They use the sun's energy to power the pump and re-circulate water from a hidden reservoir inside of the fountain. The only caveat to getting them up and running (and keeping them running) is that you need to position the solar panels in direct sunlight. Many solar fountains also come with an AC jack and adapter, so you can run the fountain even on rainy days. The fact that they cost nothing to operate makes them very appealing. Keep in mind, however, that the solar panel will need to remain at least somewhat visible in order to capture the greatest amount of sun. How can I make a water fountain without it costing a lot? Have fun if you decide to try this!